Do not bend, staple, or fold. If you have any other questions or notes, please feel free to leave a comment. Postscript: The Blogger WYSIWYG HTML editor was programmed by jerks and I totally regret using it to write this post. Here is a site for cables. Wouldn't it be easier to grab one of those USB to RS232 adapters (essentially a USB COM port) instead of using the GPIO connector plus a voltage converter ? Those thingies cost below 6€. I really wonder why they didn't use the standard symmetrical voltage for the RS232 board. Those RS232 Max ICs costed only a few cents back then and easily generated +/- 15V from a 5V power supply. I power my pi from my TV's usb port with no problems , whilst hooked up to same 22" 1080p tv.if it powers a 2.5 usb hdd it will power a pi. good luck. AFAIK the raspberry draws around 700 mA max current. Be careful. This is above 500 mA USB port spec max and might easily fry your USB port. I tried with a usb to rs232 cable from radio shack that I already had. I took a cdrom audio cable, pulled the pins from inside the connector and put them on the 3 pins on the rs232...got it to output to the screen, but it was a bunch of funny characters. Not sure where to start troubleshooting to fix it. J Gol: You can't (or at least certainly shouldn't) use a USB to RS232 directly with the Pi. RS232 voltage levels are too high (5-12V typical). The Pi needs something that speaks the serial protocol at a much lower voltage (3.3V). You can possibly find a cable or adapter that converts the RS232 signals down to 3.3V, but it's probably cheaper and easier to buy a USB phone data cable like the one zoobab linked to and cut off the phone connector. It's labeled with the different voltages right at the pins. 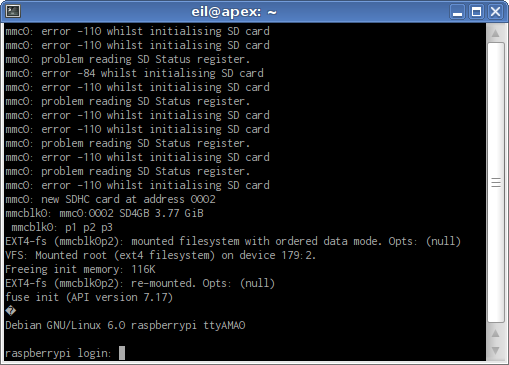 Just got my Pi, trying serial tty in Raspbian next. @Jimbo: That looks like a great USB to TTL serial adapter for the price. I haven't heard of the CP2102 chip. Let me know how well it works. @charles, Jimbo here, Yes the cp2102 adapter is working, logging in with screen. I thought I had a bad component, but I think I was just not waiting long enough to get the tty. I detached the screen session and a minute later I re-attached and there was the login prompt. I also ordered a similar, pl2303 based USB to TTL serial adapter but it hasn't arrived yet. Anyhow, woo hoo, just getting started. @Jimbo: awesome, glad it worked out. Good luck! "Remember that you have to connect the cable's TX wire to the Pi's RX pin, and the cable's RX wire to the Pi's TX pin." THANK YOU!!! Such a noob mistake, but I was banging my head against the wall for 3 hours before seeing your post and realizing how dumb I was. BTW I'm using a CP2012 USB adapter (couple bucks on eBay) and it's working great. Unless otherwise noted, all content on this blog is made available under the terms of the Creative Commons Attribution 3.0 license. If you reuse or distribute any part of it, you must provide attribution and a link to http://bityard.net. See the license for full details.